Interestingly, our government has another standard for determining the poor. The exemption limit of income tax was Rs.180 thousand per annum (which is 250 thousand now in 2014-15) or Rs.15 thousand per month or roughly Rs.500 per day in 2011-12. In a family of five members, even if we assume that there is only one earning member in the family, the per head income upto Rs.100 per day was exempted from income tax. Or in other words, at least average income of Rs.3000 per head per month was exempted from the income tax. Why does the government offer this exemption in direct taxes code? It does so simply because the government recognises the fact that per head earning of less than Rs.100 a day (as per 2011-12 prices) is not good enough. We do not have reliable data on income in India. If we look at the NSSO consumption expenditure data of 2011-12 (68th round), we see that the monthly per capita consumption expenditure (MPCE) of three-fourth of urban population is less than Rs.3000 a month and only about 5% of rural population reported MPCE more than Rs.2886. Obviously, there would be difference between monthly consumption expenditure and monthly income. However, from our daily experience we know that the families (of size 5) with income less than Rs.15 thousand per month (in 2011-12 prices) cannot be considered to be ‘well-off’ for sure. The English speaking urban upper middle class people like us would not like to call such families to be even ‘middle-class families’. Precisely, this is why the media was full of criticisms regarding our official poverty lines of around Rs.5000 in urban areas and Rs.4050 in rural India per month for an average family of five members. Individual income tax is collected by the Central government and according to the revenue foregone statement of Union budget 2013-14, the estimated number of individual tax payers was 3.24 crore (32.36 million). 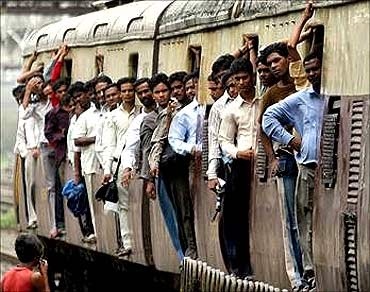 According to 2011 census, the population of India was 121 crore (1.21 billion). Therefore, only 2.67% of our total population pay direct tax in India. Agricultural incomes are exempted from taxation in India. Even if we assume the number of agricultural rich in the country to be 40 lakh (4 million), even then the proportion of direct tax payers becomesmerely 3% of population. It is argued that tax evasion is rampant in India i.e. their annual income is higher than the exemption limit but they report their income to be less than that. Even if we assume that there are 1 crore (10 million) such people in the country, who completely evade payment of direct tax (i.e. not those who pay less tax than their tax liabilities but those who do not pay direct tax at all despite earning more than Rs.180 thousand annually) then also the proportion of direct tax payers do not exceed 4% of the population. The crux of the argument is that the tax base for individual income tax is abysmally small in India. Even if we assume the average size of the household to be 5 (actually it is less than 5), and there is only one earning member in each household, then the proportion of population (including tax evaders and agricultural rich) living above the exemption line does not exceed 20% of population. If,in reality, there are more than one earning member in the household, or if the family size becomes 4 instead of 5, then this proportion would come down to even further. The rest 80% (or more) people in India are actually not so well-to-do. The real problem is not whether the poverty line should be made Rs.5 thousand or Rs.15 thousand per month for a family of five members. One can easily make distinction between two categories by calling them poor and severely poor or under extreme poverty (as the World Bank has termed it) etc. The real problem lies elsewhere. Now-a-days, most of our government benefits are being made targeted. This so called ‘targeting’ is not only limited to the targeted public distribution system (PDS) of food grains but it includes many more things including even treatment in government hospitals like All India Institute for Medical Sciences (AIIMS), even studying in government institutions like Ambedkar University, Delhi (AUD) (the cases that I personally know for sure) and so on. The problem of exclusion of the needy and inclusion of the not so needy is well known in targeting. Even if we assume that there are no such problems, what will happen to those people who are not supposed to get the BPL cards but live under below Rs.15 thousand family incomes per month in a family of five? What is alarming is that the size of this population is (as per 2011-12 data) as high as about 58% (= 80% – 22%) of the population in India. They neither can afford to pay for the essential services nor get government benefits. I am not arguing that this class is necessarily worse off than the poorest of the poor 22%; however, it is important to recognise that there is a serious problem of exclusion of middle 60% (leaving out top 20% and bottom 20% of the population) here. The national food security bill recognised this problem and extended its coverage from only the BPL card holders to more than 65% of population. This is one way of solving the problem by extending public provisions to larger section of population rather than targeting only the BPL population. Understandably, this would pose a huge administrative challenge plus there would be the risk of type-I and type-II errors of inclusion and exclusion. The other alternative is to make government provisions universal instead of targeted. In this case, through self-selection mechanism, the rich would automatically opt out from availing subsidized public provisioning of essential services. They would like to go to private hospitals for treatment and would like to send their children to fancy English medium schools so on and so forth. If we look at the 2011-12 NSSO data, 80% of rural population spends Rs.50 or below per day per head and 80% of urban population spends Rs.100 or below per head per day. Given the average market exchange rate (Rs.48 per US$) during 2011-12, these numbers are equivalent to 1$ for rural and 2$ for urban India. Given this standard also, 80% of Indian population is poor. Under such a situation, if we target only 20% population (BPL) and exclude the rest 60% not so well-to-do people from receiving social wages in terms of costless public provisioning of essential services like health and education, in my view, it would be a gross injustice to the actual ‘middle class’ in India, which eventually may result in forming a serious threat to our very democracy. Patnaik, Utsa (2013) – ‘Poverty Trends in India 2004-05 to 2009-10’, Economic and Political Weekly, Vol.XLVIII, No.40, October. NSSO Report number KI (68/1.0) – Key Indicators of Household Consumer Expenditure in India, NSS 68th Round, July 2011 to June 2012, Ministry of Statistics and Programme Implementation, Govt. of India, June 2013. The author is Assistant Professor at Centre for Economic Studies and Planning, JNU.